We’re ready to head to San Diego once again for the Annual International Esri User Conference (ESRIUC) and have shared details of where you can find us, what we will be sharing, contact information, location map, and more. Enjoy our ESRIUC plans via this Story Map / Map Series – we look forward to seeing you at the conference! The 2018 Esri USer Conference (ESRIUC) takes place July 9-13, 2018 in San Diego, CA. The GEO Jobe team is pleased to be an exhibiting partner once again, and we hope to see you there! ESRIUC is always a treat where we can get up close with our users, other developers, business partners, ArcGIS system architects, and like minds. ESRIUC is a favorite time of the year to meet our users. This is our chance to hear what you enjoy about our solutions (like Admin Tools for ArcGIS Online) and pick your brain about how we can be even better. Got an idea for a new Tool? This is your chance to tell us about it. The GEO Jobe team will be available to answer questions, provide product demos, and discuss custom solutions built on the ArcGIS platform. Additionally, they will be sharing what’s planned for the company’s popular solutions including the award-winning Admin Tools 1.2 for ArcGIS Online (free, Pro, and for Portal), Mapfolio, GEO Powered Cloud Managed Services, and other new solutions. 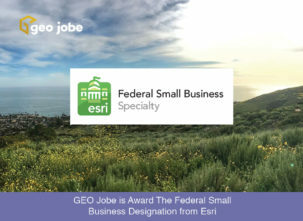 David Hansen, GEO Jobe COO, will be on hand to discuss GEO Jobe software development, partner opportunities, and enterprise solutions, as well as experiences with the ArcGIS Marketplace and working with Esri small business start-ups. Note, Hansen is also very passionate about the YPN and is always eager to discuss the ArcGIS ecosystem with young professionals! Managed Services – Visitors to Booth 2031 will learn about GEOPowered Cloud Managed Services. “Host your ArcGIS Enterprise license using our GEOPowered Cloud Managed Services. It’s all the power of ArcGIS Enterprise with none of the hardware hassle. We set it up for you, and you use it how you want!” Hansen notes how, for the customer, this means 100% access to all the power of ArcGIS Enterprise leveraging Amazon EC2 technology combined with access to our experts (setup and support). Yes indeed, this means you don’t have to wear multiple hats and also be an AWS expert; that’s where David and the team of experts come in. You can find us at Booth #2031 at ESRIUC or setup a meet by nudging us on Twitter or Instagram @geojobegis – Will you be there? Stop by the GEO Jobe Booth 2031 to meet the team. We’ll have some cool #MapThis swag & giveaways! 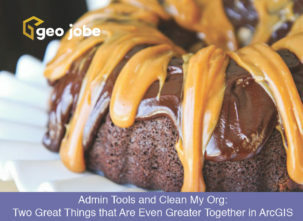 If you’d like to book a time to see us or arrange a meeting, feel free to reach out to us via Twitter @geojobegis or email connect@geo-jobe.com – See you in San Diego!